My grandma has been enjoying a media whirl, featured in The Dunfermline Press, Courier, Sun, Daily Record, The Scotsman and on Reporting Scotland for being the world’s oldest yoga teacher. The holder of the world’s oldest yoga teacher crown is about to be toppled – by a Scot who is just two years away from celebrating her 100th birthday. Connie Dennison is set to take the Guinness World Records title from a Canadian pensioner, after finding out she is two years older than her fellow yogini. It has taken many months for her two daughters, five grandchildren, ten great-grandchildren and many devotees of her teaching to convince Mrs Dennison to claim her rightful title. They told how Mrs Dennison, 98, had agreed to them getting in touch with the Guinness book only after being persuaded by pupils at the weekly class she has held at the same Dunfermline church for 40 years. 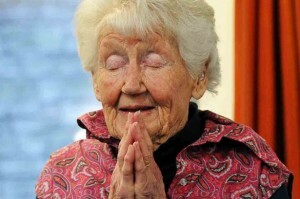 It comes a year after Canadian Ida Herbert, 96, was named as the oldest yoga teacher in the world. Mrs Dennison’s granddaughter Susannah Dean, 43, said she was pleased her grandmother was finally interested in applying for the title. She said: “She’s always said no in the past, but I think she’s enjoying herself just now, and now we know that she is definitely the oldest, it’s wonderful. She started practising yoga when she was living in Melbourne, Australia, when she was in her 40s. At that time, yoga was almost unheard of in the UK. The former hairdresser, who drove trucks across the UK delivering food supplies during the Second World War, has outlived her two sisters and brother. Her husband, Tom, a retired minister, passed away 20 years ago. Her pupils include more than a dozen women who attend the weekly sessions at St Leonard’s Church in Dunfermline. Marion Slaughter has been attending Mrs Dennison’s classes for about 20 years. She said: “I love the class; it keeps you moving. Connie is the most fabulous person I’ve ever come across. Mrs Dennison has always started her classes at 10am sharp, beginning with relaxation techniques. During her 60-minute class, she takes her group through a series of moves, including sun salutes, tree pose and child’s pose. Still flexible thanks to a lifetime of regular practice, she is capable of more advanced poses, in which she extends her legs over her head. Guinness World Records unofficially confirmed the Scot appeared to be the world record holder.